It is Time for Golovkin to Drop the IBF Belt? By Donavan Leonard: “All the belts” was the mantra put forth by middleweight champion Gennady Golovkin (38-0-1, 34 KOs) when his invasion of the United States began in September 2012 with a TKO victory over Grzegorz Proksa. The fighter known as Triple G had not been afforded an opportunity to fight for a title while promoted by Universum, although they had two other champions in their stable, Felix Sturm and Sebastin Zbik. Feeling frozen out, he made the move to K2 promotions, who put him on his current path. The talk about unifying belts and conquering all the other champions was his way of trying to corner other champions, cutting off the ring so to speak, so that they would eventually have to fight him. The real purpose of this chatter? Financial security. When Golovkin was being introduced to American audiences, popular fighters such as Sergio Martinez and Julio Cesar Chavez, Jr. held belts. Other more popular fighters had made noises about moving up in weight (Miguel Cotto, Saul Alvarez). As lucrative bouts with Martinez and Chavez never transpired, and Cotto and Alvarez moved toward their own title bout, Golovkin had few options. He could become a paper champion defending against perceived or actual weak mandatory challengers, or he could pursue the other titles available to increase his recognition and give his claim as being the best middleweight additional credence. His wins over Marco Antonio Rubio and David Lemieux provided those titles, and he was presented two options: fight Billy Joe Saunders for the WBO and final “recognized” belt, or face Alvarez for by far the greatest amount of money he could earn. Golovkin, as most people would, chose the Alvarez option. That move solidified the fact that Golovkin is (rightfully) fighting for the ability to provide for himself and his family, and not to gather the most sanctioning organization trinkets. That fight took place September 2017, and a rematch is likely for September 2018. Meanwhile, mandatory challengers for various belts have been lining up. Conquered foe Daniel Jacobs, Sergiy Derevyanchenko, and Jermall Charlo are now waiting their turn for a shot at the title. As a fighter who had to wait an inordinate amount of time to get his chance for a title, Golovkin should do the right thing and drop, at the very least, the IBF belt. Golovkin had a chance to fulfill his obligation to IBF challenger Derevyanchenko, and his team chose to fight a non-mandatory challenger in Vanes Martirosyan. Regardless of Martirosyan’s credentials, he did not fulfill any of the requirements for a title bout. He was not a fellow champion in the weight class, and he was not the mandatory by any organization. Triple G has been ordered to fight “The Technician” by August 3rd, but with the Alvarez rematch on deck in September, the chance of that fight happening is zero. Golovkin holding onto the belt for even a day longer is not fair to Derevyanchenko or his opponent for the vacant belt (possibly Jacobs). Any other action is freezing the belt and is preventing these fighters from fighting for a title in a timely manner-something to which he should be able to relate. There are positives for this move. Not only would one of those fighters be able to call themselves champion (although Golovkin would still be considered the best in the division), but it would provide a great fight for fans. If Golovkin does not drop the IBF belt or is not stripped, Derevyanchenko will most likely take another stay-busy fight against the likes of Dashon Johnson and Jacobs would likely face another Luis Aris-type opponent. Those are not the matches that the fans would prefer to see, and those are also not the bouts that would provide top motivation, or purse, for these fighters. Another positive for allowing other fighters to compete for the belt is that if GGG continues to win, then the next time it is time to face the opponent, say Derevyanchenko, then it would be facing another champion. Today the bout would be “champion vs mandatory”, but if this fight takes place after (in theory) a Golovkin win and a Derevyanchenko win, then it will be promoted as a unification bout, with two champions determined to decide who truly is the king of the division. Calling a fight, a unification bout may be putting lipstick on a pig (see Julius Indongo vs. Terence Crawford), but it is still better marketing than simply calling it an obligation before the next big bout. This could be applied to any belt that Golovkin can shed and remain a titlist. If Golovkin truly wants to hold all the recognized belts for a day as Crawford did, his next bout needs to be with Billy Joe Saunders. One belt is all it will take to get Canelo back into the ring with him in September. If the amount of money he will earn is now his focus, then he needs to do the right thing for all the other fighters in the division, as well as the fans, and drop the extra belts, along with the hashtag. 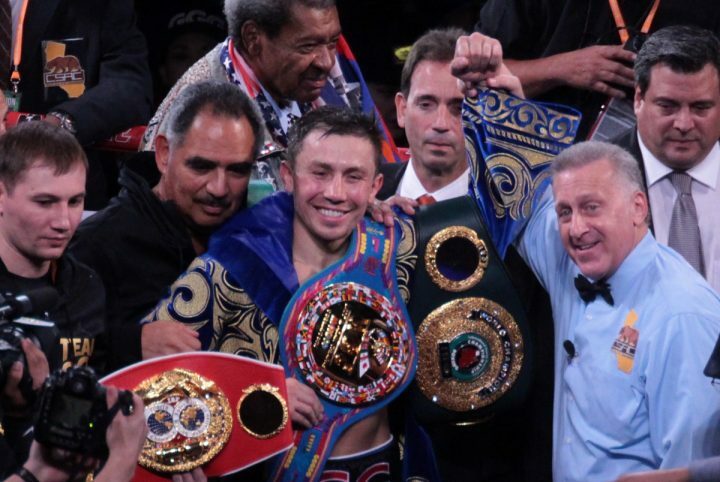 Boxing » Gennady Golovkin » It is Time for Golovkin to Drop the IBF Belt?